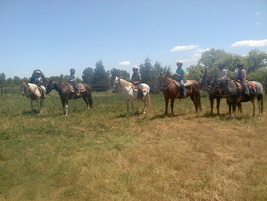 Each child is assigned a horse to take care of for the week. They learn horse care, including grooming and saddling. They water and feed their horses and learn to groom and take care of them after the day is done. We ride daily, whether it be in the arena, or out on trail!! Kids should bring a healthy lunch and drink in a cooler, which they will be able to enjoy in our shady area. Cowboy boots, long pants (jeans-with no glitter on the back pockets and no slick pants or sweats), a hat, and sunscreen are required. Bring your own approved riding helmet, or use one of ours free of charge. Our camps are ideal for first time participants or previous campers who would like to do it again. Upper level camps available-Call for more information. Please plan on arriving 45 minutes prior to start time on the first day, then 15 minutes prior to start times on the remaining days. Your cooperation is needed and appreciated. As space is limited there will be no refunds. Make-up times will only be scheduled to to inclement weather, so please plan ahead. A State Park Pass is required for each vehicle to enter the park. Parks allows vehicle to enter park for drop off and pickup only without Parks Pass for camps only. 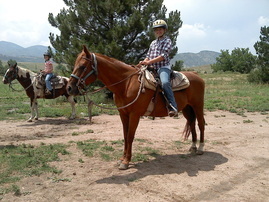 To sign up for a horse camp fill out below registration form (use either pdf or .doc version) and email to chatfieldstables@yahoo.com or call 303-933-3636. Call to confirms space is available and to pre-register. Full payment is due at time of registration. Must send in with registration form. Must be local checks or money orders. 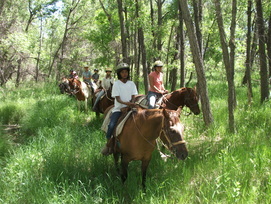 Horse Camps can be combined with Pony Pals for a discounted rate. We would add a Friday ride to Pony Pals and do five sessions for the week instead of two times a week for two and a half weeks.